This is a frame saw for my workshop that I recently completed. The basic dimensions are about 33” x 16”, although the handles are about 30” wide. This is my own design and was built with hand tools. 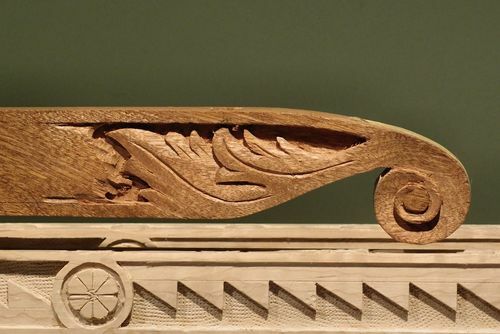 The two ends are African Mahogany, carved with acanthus leaves and scrolls. 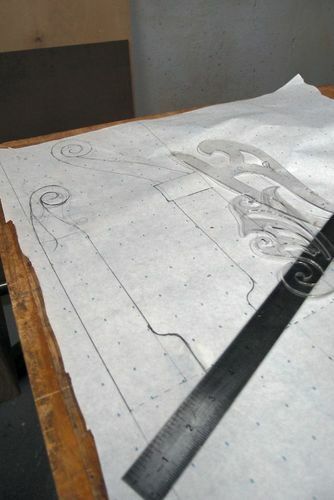 The secondary end features a flower motif that is echoed on each of the stretchers. 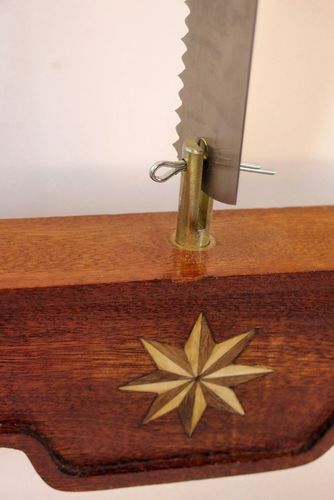 The driver’s end features an inlaid compass rose in Cherry and Holly that is intended to help guide the saw to cut straight and true. 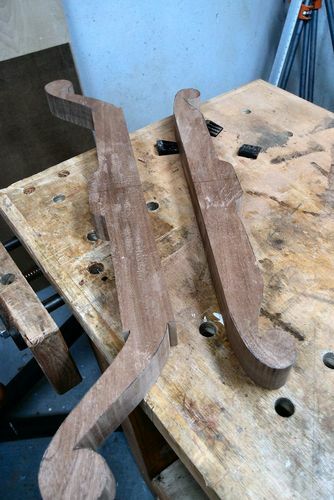 Each end is center drilled for the mounting hardware. 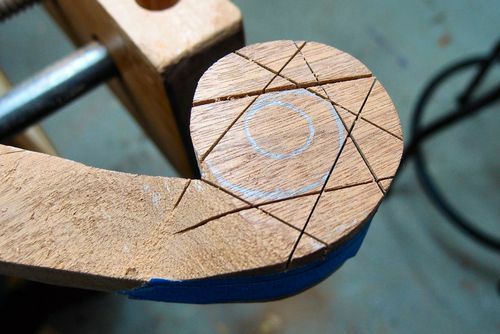 The mounting hole is lined with hard maple to reduce wear. The mounting hardware uses toggle-style stud anchors from McMaster-Carr. The toggles are drilled out and replaced with (at least temporarily) cotter pins. (I think I stole this idea from someone here on Lumberjocks, but it was so long ago I don’t recall whom!) The anchors are retained by brass nuts and washers, and the saw blade is tightened using opposing wrenches on either end of the saw. The blade is 700 mm Rip Frame Saw Blade from Highland Woodworking. 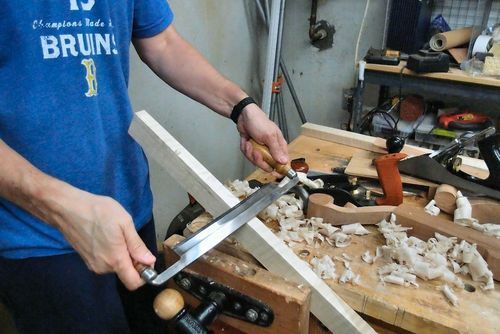 The saw was finished primarily with hand planes and scrapers. 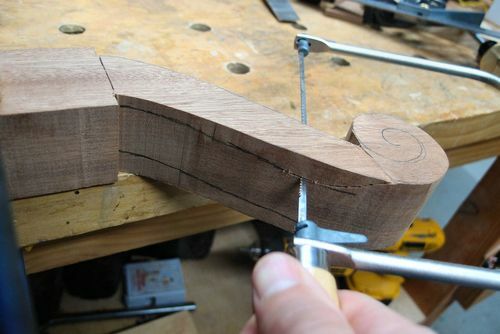 (I had to fashion a number of small curved scrapers to finish the scrolls.) The handles and a few problem spots were sanded. 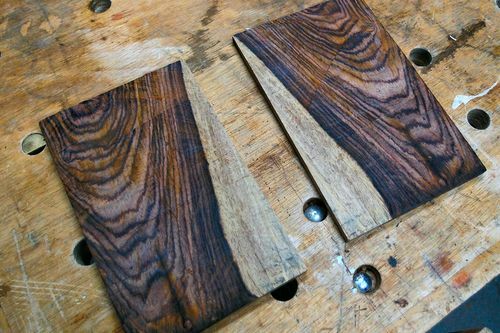 A coat of boiled linseed oil was followed with several coats of wipe-on satin-finish polyurethane. I have the hardware for a matching kerfing plane, but I haven’t started that yet. What a beautiful saw, it’s too pretty to use. Great job on the build, if it cuts half as good as it looks, it will be a great addition to the shop. That about the best frame saw I’ve ever seen. When I get more time I’ll watch the video and study the pics. I just got a hardware kit from Bad Axe Tools that I hope to build a frame for one of these days. I like the contrasting wood color too! Looks awesome. Will you actualy use it? It’s so beautiful it can easily hang on living room wall as decoration. Wow! This is a beautiful shop made saw. Congratulations on a great saw. Fabulous saw that will serve for generations. Beautiful work. That is one beautiful piece of workmanship. It’s almost to pretty to use. You set the bar pretty high. The carvings are great. Wow. This looks like it should be a musical instrument. Simply an amazing piece of functional art! Impressive to say the least. Just wow! Thanks everyone for the kind comments! 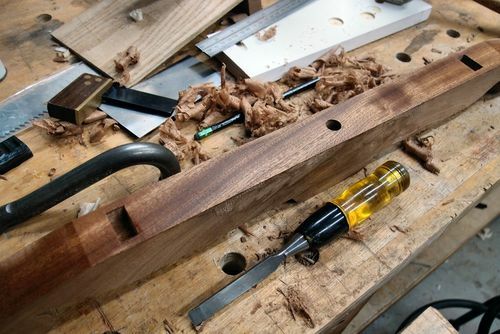 I probably should have said, but I have been inspired by the Studley tool chest and stories of the craftsmen of the past to make tools that reflect my love of the art of woodworking and (even though I don’t make my living as a woodworker!) 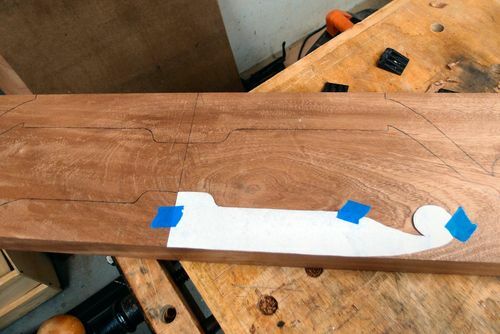 advertise the beauty of woodworking.